Pissaladière has always been one of my staple dishes to put out for large parties. These days I’m happier with smaller sit-down dinner parties, so I probably haven’t made more than one pissaladière in the past decade (that was for my 40th wedding anniversary party). In my younger days I mostly used the recipe in the first volume of Julia Child’s Mastering, and sometimes the one in Mireille Johnston’s Cuisine of the Sun. This week, browsing through my old copy of Julia Child & More Company, a book from her “French Chef” television series, I came across a recipe called Pissaladière Gargantua that was a bit different from both those others, and decided to give it a whirl. The experience was both good and bad: quite good in the outcome, but with some surprising defects in the procedure. Let’s have the good news first: It made an attractive tart. The pastry – just the book’s basic dough, indicated for pies, quiches, tarts, tartlets, and flans – was wonderful; the best I can ever remember making. It was rich and tender and softly crumbly, with a faintly nutty flavor. I don’t know why it was so much better, because the proportions of flour, butter, and lard were only negligibly different from those of my usual recipes (Irma Rombauer’s and Bernard Clayton’s). The only thing I did this time that I don’t regularly do was to smear out the dough with the heel of my hand to make a final blending of fat and flour. I can’t believe that would make such an improvement, but I think I’ll keep doing it in the future! The problems emerged with my downsizing of the quantities of filling ingredients – and this time they were not the fault of my arithmetic. The recipe called for a full-size jelly roll pan, about 11 by 17. 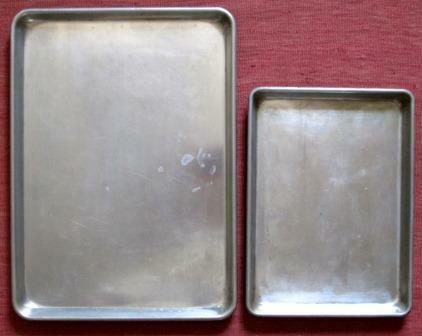 I didn’t want a gargantuan version, so I planned to use a 9 X 13 pan, which holds about 60% of what the larger pan holds. Here are the two sizes. The full recipe calls for 4 cups of sliced onions, 60% of which is about 2½ cups. That’s how much I sliced and cooked slowly in olive oil until tender but not browned. I did this in the morning, without any thought for how that quantity would work in my chosen pan. Toward dinner time, when I started assembling everything, I realized there wasn’t going to be anything like enough onion. I quickly pulled out a 9 X 9 pan. 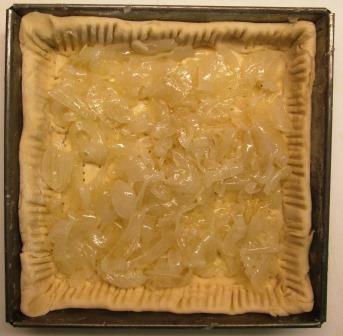 When I’d lined it with pastry and spread in the onions, they barely even covered the bottom of that. Now, this could NOT have been my error. 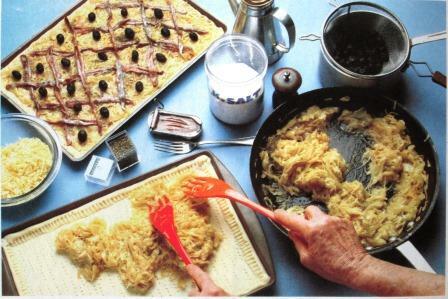 Here’s the book’s photo of the pissaladière being assembled. Look at the vast amount of cooked onion there. No way could that have started out as four cups raw! Nothing daunted, I soldiered on. To complete my small panful I didn’t even try to calculate amounts of the remaining ingredients. I just arranged some anchovy fillets and black olives on top of the onions and sprinkled on grated cheese and a little more olive oil. While doing that, I discovered another problem with the recipe. There was a teaspoon of oregano or thyme listed among the ingredients. Oh drat, I thought, I’ve forgotten it! Where was it supposed to go? A good question, but no answer. There was no mention of the herbs in the instructions. (I made Tom read through them too, just in case I was not seeing it.) So I skipped the herb. I have to say the pissaladière came out well enough, considering that we really would’ve liked more onion. The oil-cured Moroccan olives were fine. For the grated cheeses, the recipe encouraged a mixture, so I used Manchego and Podda, which were very nice. And, as I said above, the crust was truly delicious. I did get a bit carried away with the anchovies. The recipe called for canned filets packed in oil. Mine were large whole ones packed in salt, and even after gutting, boning, and careful rinsing, they were very strong. I used only six filets, but in that small a tart they took over the flavor. Not a big problem, though: we just picked some of them off. The lesson here, I guess, is that sloppy copyediting can spoil the best of recipes if you aren’t nimble enough to make mid-course corrections. Out of curiosity, I later checked back on the pissaladière recipe in Mastering, volume I. 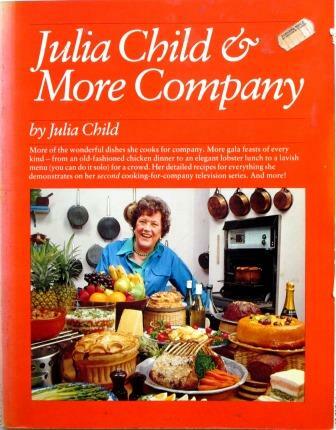 There Julia calls for two pounds of onions for an eight-inch round pan. So I suspect the quantity for this Gargantuan one ought to have been four pounds, not four cups. I’ve marked the correction in my book. One happy ending, however: I now have a lot of extra excellent pastry dough in my freezer! Small culinary world! Just a couple of weeks ago I wrote in my own blog (http://clayrussell.com/2013/07/julia-child-and-the-boudin-blanc-problem/) about a flaw I found in a Julia recipe (Boudin Blanc in Mastering the Art, Vol. 2). In fact I came across your blog while looking to see whether anyone else had noticed that particular mistake. Alas, I didn’t. I suppose it would be nice if Julie Child (and, by extension, her editors and their staffs) were without flaw. Or our parents, our friends and we ourselves. But I also suppose that even the great ones are entitled to their mistakes, and Julia’s place in my pantheon is unshaken. 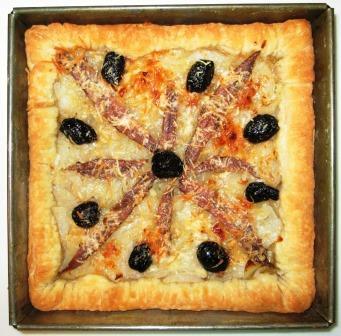 As for the pissaladière – I’ve used this recipe myself many times and never noticed a problem with the volume of onions. But now I’m inclined to make the damn thing and see what happens. In any case, I enjoy your blog and will keep coming back! You’re absolutely right about the JC & Co TV series, Clay, which just shows that I ought to read the introductory material in my cookbooks more carefully! And indeed, my 1970 first edition of Mastering has the same flaw that you explicated in your blog. I’ve never made the recipe, which is my excuse for not noticing. If you make the pissaladiere from JC & Co. soon, do please report back. I can’t see how I could have gotten the quantities wrong, but I’m willing to be educated.